Red-crested pochard, ële de Camargue, France. Photograph by Art Wolfe. 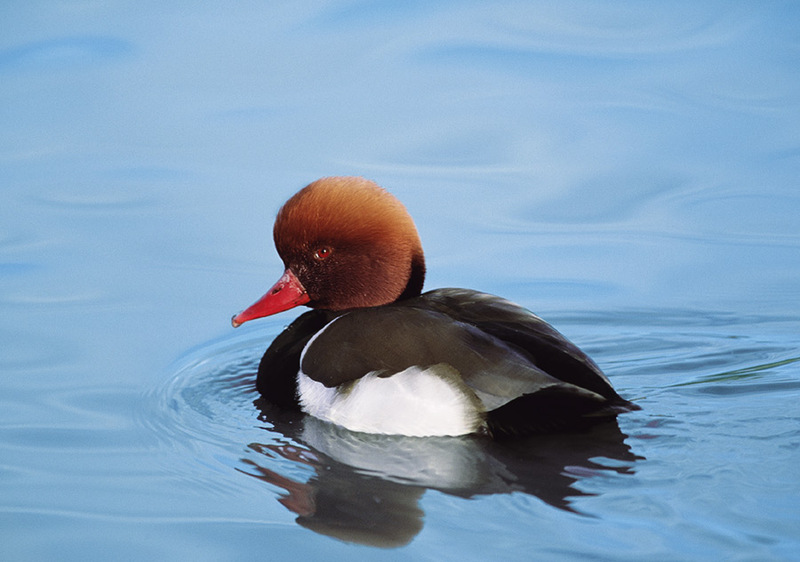 The male red-crested pochard (Netta rufina) cuts a striking figure with his rounded orange head, red bill, and black chest; females must make do with a more subdued wardrobe consisting mostly of browns and beiges. Perhaps to assuage his mate’s sartorial dismay, the male will dive for food and bring it to the female—a unique practice in the duck world. Wide ranging across Europe, Asia, and North Africa, red-crested pochards often gather in large flocks on bodies of water, where they dive and dabble for tasty aquatic grasses and the occasional fish or amphibian.